Over the course of the year, the Planetizen staff editors review and post summaries of hundreds of articles, reports, books, studies, and editorials related to planning and urban development. 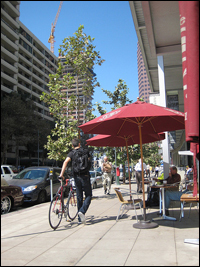 Now, we take a look back at 2008 and the trends and issues that defined the year in urban planning. The economy and the housing market dominated the news this year, but there was also a considerable amount of coverage related to the Presidential election and President-elect Barack Obama. Transportation investment and city living were also major themes of the year. Read the full summaries below to see how these stories played out in 2008. You can also listen to the podcast version of this summary by clicking the player below. Visit the Top Planning Issues of 2008 podcast page to download this podcast. The podcast version of this summary originally aired on the nationally-syndicated radio program Smart City, which is broadcast in cities across the U.S. Learn more about Smart City and listen to archived shows. The downturn in the global economy was the defining issue of 2008. It has affected nearly every aspect of American life, including our towns and cities. The tumbling stock market and reduced consumer spending have slowed commerce in the U.S. and, as a result, local tax revenues are down. With less money in general funds and little hope for a rapid rebound, cities across the U.S. are being forced to make budget cuts. More than 200 city jobs were cut in Atlanta in late 2008, 400 city employees in San Francisco were laid off, and 1,000 employees were handed temporary layoffs in Toledo, Ohio, to name just three cities among thousands. Planning and community development departments are certainly not immune. For many planning departments the situation is exacerbated by the fact that a large portion of their budgets is based on revenues generated by construction activity/permit fees. Given the precipitous drop in construction, planning department budgets have been particularly hard hit by the recession. Cities are also increasingly focusing on budget areas previously considered untouchable, like public safety services. Some cities, for example, are looking at ways of revamping police and fire services to cut costs. With no clear end to the recession in sight, cities are undoubtedly going to continue to feel the pain. How much pain there is will largely be determined by how creatively cities adapt to the current situation. July 15 - Who Picks Up the Slack When Counties Dissolve? Oct 18 - Which Cities Stretch Dollars The Farthest? Dec 2 - Roads or Police? One bellwether of tough economic times this year has been the rash of foreclosed homes that has spread across the country. Bad loans and falling property values have forced thousands of Americans out of their homes, often emptying entire neighborhoods. Suburban ghost towns have popped up around the nation in places like Riverside, California, much of suburban Phoenix, as well as central Florida. With the economy in a sour state, values are expected to fall even further. Recent figures show that more than one-quarter of American homeowners owe more on their mortgages than they could possibly hope to gain by selling the houses. Economists are estimating that figure could rise to nearly 40 percent in early 2009. While things are certainly gloomy as we enter 2009, there may be a bright side to the housing fiasco. Some economists are predicting that the downturn in the housing market will usher in a new era of more reasonable mortgage and loan policies, and a new stock of smaller homes. After years of oversized homes and McMansions spurred, in part, by the building boom, home builders may shift direction towards housing that is smaller, more energy-efficient, and lower-priced. But as with the auto industry, we'll have to wait and see. Feb 29 - Are Planners to Blame for the Mortgage Meltdown? In addition to the foreclosure blight that has hit both cities and suburbs, 2008 saw thousands of suburban residents leaving the comfort of their spacious subdivisions and moving back to the city. Rising oil prices and concerns about the environment also contributed to this new trend, with legions of people ditching far-off homes and long commutes for the convenience of being closer to their jobs. But just being a big city in America doesn't mean the jobs will come. Places as diverse as Detroit, Reno, Cleveland, and Vallejo, California saw huge drops in job growth. But at the same time, employment opportunities increased in cities like Denver, Chicago, and Seattle. Some have focused on the relationship between job growth and the "creative economy" -- such as tech-based jobs like web development and software design. But the return of the city isn't purely utilitarian. Urban areas are also coming back because people, especially those in their 20s and 30s, are increasingly attracted to places that are walkable, diverse, and that offer environmental and cultural amenities. 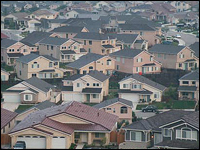 Jan 7 - Sub-Prime Crisis + Expensive Gas = End Of Sprawl? Mar 11 - How Will Changing Cities React? Oct 23 - Is it 'Over' for the American Landscape? The sharp rise in global oil prices in 2008 led to at least one outcome many would have thought impossible just a few years ago: a reduction in the number of vehicle miles traveled in the U.S. Americans drove 100 billion fewer miles between November 2007 and October 2008 than the same period a year earlier. Indeed, it was the first decrease in VMT in nearly 30 years. 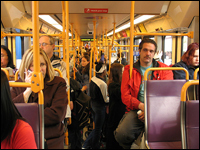 Equally dramatic: sharp increases in public transit ridership. Figures for cities like Los Angeles and Washington, D.C. showed increases of 15 to 25 percent compared to the prior year. But as ridership increases across the country, many transit systems are becoming overwhelmed and don't have enough buses or trains to handle the demand. The importance of providing funding for public transit has become clearer to millions of Americans, and they took this new conviction with them to the polls this past November. Election day saw voters in cities and counties across the country give the green light to public transit, both for new projects and improvements to existing systems. With a new president entering office in 2009 and a congressional majority behind him, many transit advocates are hoping America is entering into a renaissance of public transportation. Another important advancement for cities was the election of Barack Obama as President of the United States. Obama is notably the first president to have grown up in cities since William Howard Taft was in office almost a hundred years ago. Obama's experience as a community organizer in Chicago gives him a direct connection to the problems facing urban areas, and many in the field of planning are hopeful that this connection will shine through in the new president's policies. 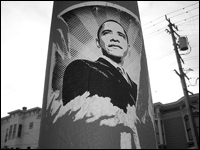 His election season rhetoric seemed to indicate that urban issues would play a big role in an Obama presidency. His campaign has stressed the need for new infrastructure investment, a more environmentally-concerned energy policy, and a more regional focus to address the problems facing increasingly interconnected America's metropolitan areas. New Vice President Joe Biden also stands to benefit the country's urban policy. As a dedicated Amtrak commuter, Biden is likely to serve as a strong advocate for the often under-funded national train system. Furthermore, the Obama transition team's announcement that his administration will be establishing a cabinet-level Office of Urban Policy is further evidence that President Barack Obama could mean good things for the nation's cities. Nov 19 - Can Infrastructure Spending Unite America? Take a look back at the top issues from past years and compare with this year's list to see the most pervasive trends in urban planning. Photos courtesy flickr users and Planetizen flickr pool members DG-rad, kworth30, La Citta Vita and jonnaro.